Epcot is the Disney park best known for its festivals, and for good reason! Rarely does Epcot not have a festival going on, and while this may mean more crowds (especially on weekends), the festival offerings definitely make up for it! Each festival is unique, and there is a ton to love at each one. In fact, the festivals have become so large, that it’s become necessary to do a little research on festival events before your trip. I could write a book on the different festivals offered at Epcot, but luckily, I’ve been able to list the specific reasons why I love them- and why I think you will love them too! Epcot currently has four festivals that they host throughout the year. The International Festival of the Arts runs from January to February and features Disney artists, as well as concerts from Disney Theatrical Productions to celebrate Broadway talent. The International Flower and Garden Festival, which runs from March to June, celebrates Spring by covering Epcot in colorful flowers and plant beddings, showcasing a ton of Disney character topiaries, and serving fresh, light food at a multitude of Outdoor Kitchens. Epcot is probably best known for its International Food and Wine Festival, which will be celebrating its 24thyear in 2019. It runs from August to November, and in addition to hosting over 30 Global Marketplaces featuring food, wine, and beer, the festival also has seminars, tasting events, and workshops with celebrity Chefs. Lastly, there is the International Festival of the Holidays, which runs from mid-November to December. The festival focuses on holiday food and traditions from around the world, with lots of live storytellers, seasonal dishes, and festive entertainment. Each of the four festivals plays host to various bands, storytellers, and musical groups- it’s impossible to see them all! During the Festival of the Arts, guests can enjoy the Disney Broadway Concert Series, which features performers from some of Disney’s best Broadway musicals like Aladdin, The Lion King, Frozen, and Mary Poppins. The Garden Rocks Concert Series takes place during Flower and Garden, with bands from the ’70s, ’80s, and ’90s performing at the American Adventure Pavilion. The Eat to the Beat Concert Series is held during Food and Wine, with nightly performances at the American Gardens Theater. My husband and I got to see the Plain White T’s perform one year, and it was an amazing evening! During the Festival of the Holidays, you can visit the different countries around World Showcase to see the holiday storytellers, and learn about holiday traditions from countries like Norway and France. There are also musical performers around the World Showcase, and the American Adventure Pavilion has the Voices of Liberty dressed as Dickens Carolers, performing holiday songs. 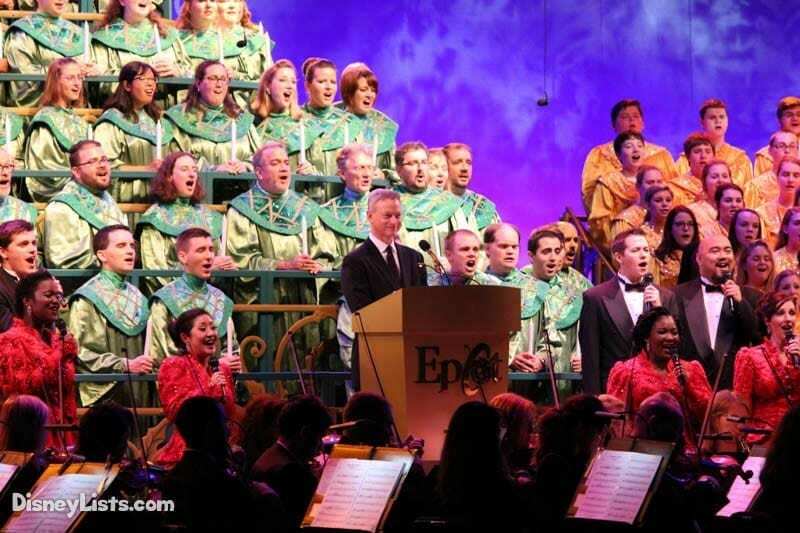 The most popular entertainment offering during Festival of the Holidays is the Candlelight Processional, where a mass choir and live orchestra, along with a celebrity narrator, tells the story of Christmas. If you plan to attend any festival performance, make sure to grab a Time’s Guide at the front of the park- and if necessary, book ahead of time. A great thing about the festivals is that they truly have something for all ages. As an example, for those guests who are picky eaters and don’t drink wine, but still want something to do as they stroll along the World Showcase, there are scavenger hunts. Every festival has a specially-themed scavenger hunt, and you can purchase a map and stickers to help you along the way- just keep an eye out throughout the countries in order to spot hidden characters like Figment and Remy. Aside from the scavenger hunts, there are unique activities that are only offered during festival time. At the Festival of the Arts, there is a giant paint-by-number mural that guests can help create with their own paintbrush and cup of paint. There is a beautiful butterfly garden and sanctuary on display during Flower and Garden, as well as an exhibit for purple martins (migratory birds who fly over 3,000 miles from the Brazilian Amazon to Epcot). During Food and Wine, guests can visit The Chocolate Experience in the Festival Center, and see sculptures created entirely from chocolate. During Festival of the Holidays, the storytellers are a hit with all crowds, guests can meet Santa and Mrs. Claus, and even partake in a cookie stroll! Throw in food, characters, and music, and you’ll definitely find lots of festival activities the whole family can enjoy! One of the cool things about Epcot festivals is that, if you plan accordingly, you might get to see a celebrity- or even a TV show taping! During the Festival of the Arts, featured artists will take up residence in a Visual Arts Showcase, where they can discuss their work with guests and answer questions. At Food and Wine, you can sometimes see celebrity Chefs such as Robert Irvine, Masaharu Morimoto, Buddy Valastro and Art Smith at different events. ABC’s “The Chew” has broadcasted from Epcot’s Food and Wine Festival in the past, and it’s always cool to watch the behind-the-scenes of a television show taping. If you’re interested in seeing a Disney legend or special guest, definitely look up the schedule of events before you head to the festival! You may even be able to get your cookbook, wine bottle, or piece of art personally signed. There are beautiful art pieces, plants, and gardens that adorn every Epcot festival, but special attention must be given to the topiaries displayed during the Flower and Garden festival. Over 100 green “sculptures” can be found throughout the park, and they present wonderful photo opportunities. They are all fashioned after Disney characters, and my favorites include Belle and the Beast dancing at the front of the France Pavilion, Snow White and the Seven Dwarfs in Germany, and Anna and Elsa at the Norway Pavilion. If you visit Flower and Garden, definitely try to see them all- you won’t be disappointed! The festivals at Epcot offer some of the most amazing classes, and I always wish I was able to take more advantage of them. 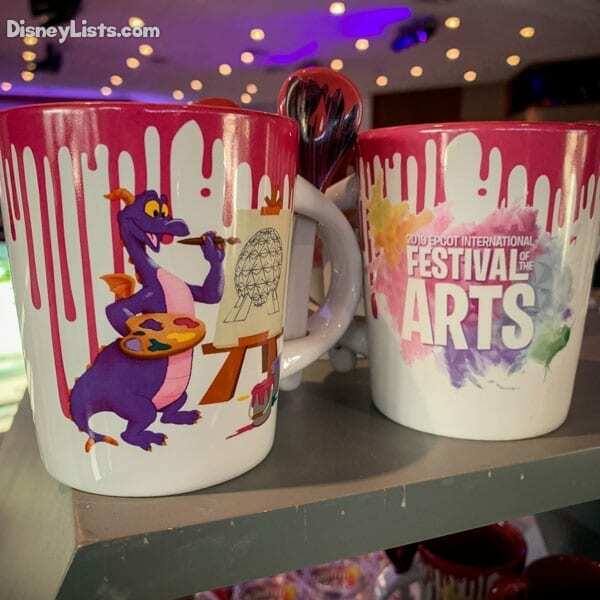 During the Festival of the Arts, they have the Paint with a Disney Artist program, as well as a variety of workshops that teach different artistic techniques. If you’ve ever wanted to learn floral design, watermelon carving, or how to make park-map bouquets, then you should definitely look into the schedule of seminars. In the past, the Flower and Garden Festival has held gardening seminars. During Food and Wine, there are Mix It, Make It, Celebrate It! Seminars, Cheese Seminars, Beverage Seminars, and Culinary Demonstrations. You can partake in wine tastings, and learn cooking tips from some of the top chefs at Walt Disney World. Some workshops are free to Disney guests, while others charge a fee. Definitely, do your research, and sign up for a few if you can! If you don’t want to sit for a workshop or class, then a guided tour is the next best thing during a festival! The Flower and Garden Festival offers the Gardens of the World Tour, which is a three-hour experience with a Disney Horticulturist around the World Showcase. Another popular tour during Flower and Garden is the Royal Tea Garden Tour, which takes a group around the United Kingdom Pavilion- guests will explore a tea garden and learn the art of growing tea leaves. Like the workshops, tours may differ year to year, and new experiences are always being offered. It isn’t a festival if there isn’t a special merchandise booth…or several merchandise booths! During the festivals, you can bring home souvenirs that you can’t get at any other time of year. During the Festival of the Arts, you can buy your favorite piece of Disney artwork (and get printed accessories of it). For Flower and Garden, you can buy decorations for your own garden, including statues, watering cans, and wind chimes. Expect to find lots of cookbooks and kitchenware for sale during Food and Wine, and festive items with Disney characters on them during Festival of the Holidays (for example, I’ve seen a Chip and Dale Nutcracker set, and a Festival of the Holidays cookie jar). The festivals usually sell Limited Edition Magic Bands, T-Shirts, Spirit Jerseys, Pins and Ears emblazoned with that year’s mascot on it. Make sure to take advantage of any festival-exclusive merchandise that you want to take home. If you’re looking for that perfect, unique Instagram shot or family photo, then check out one of the festivals- there’s bound to be a few festival-exclusive photo opportunities! During Festival of the Arts, you can literally step inside famous works of art and take fun pictures, such as becoming a part of the Washington Crosses the Delaware painting, and the Mona Lisa. The Flower and Garden Festival has the topiaries, which provide the perfect photo backdrop, and the Festival of the Holidays gives you the opportunity to pose for photos with Santa. Every festival offers large, themed cardboard cutouts at the front entrance of Epcot, and it’s always nice to take a photo in front of that year’s festival sign or logo. Also, PhotoPass will usually offer Magic Shots specific to that year’s theme. Make sure to stop when you see a photo opportunity and savor lots of memories of your time at the festival. Or, if you’re like me, take a lot of pictures of the food! My husband was just a casual theme park fan until we visited Epcot’s Food and Wine Festival for the first time in 2015. After tasting all the different food from around the World Showcase, he finally transitioned into a full-fledged Disney fan- and we haven’t missed a Food and Wine Festival since! The food is definitely the main draw for each of Epcot’s four festivals. Specialty food booths are set up around World Showcase, with a few in Future World. Guests can pick up a passport from the park entrance and make their trek around the park, trying as many dishes as possible. The food is themed to each specific festival; there are usually a few new booths introduced each year, but there are always returning favorites. Festival of the Arts offers Food Studios, such as The Artist’s Table, Pop Eats!, and The Deconstructed Dish. The focus during this festival is on the presentation of the food; Cast Members may take a little more time in preparing each meal to make sure the servings look perfect. The Flower and Garden Festival has Outdoor Kitchens with fresh and flavorful themes, such as The Berry Basket, The Honey Bee-Stro, and The Smokehouse. My favorites during Flower and Garden are definitely the variety of tasty drinks- I love the Violet Lemonade at the Pineapple Promenade booth and the Watermelon Cucumber Slushy from the Florida Fresh Booth. During Flower and Garden, the booth in Japan (Hanami) serves Frushi (sushi made from fruit)! 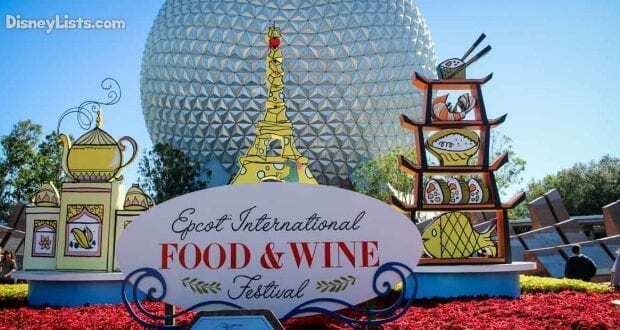 The Food and Wine Festival offers probably the most variety of food, which is prepared in over 30 Global Marketplaces. These include Active Eats, Flavors From Fire, and the Light Lab in Future World, along with booths featuring food from Australia, Hawaii, India, Ireland, and Thailand (just to name a few) around the World Showcase. Most of these dishes are expertly paired with beers, wines, or cocktails, and tasting samples are usually available for purchase. Finally, during the Festival of the Holidays, guests can indulge in numerous Holiday Kitchens. These booths offer traditional holiday fare from around the world- you can get turkey with stuffing, mashed potatoes, and cranberry sauce over at the American Holiday Table, but you can also try a variety of different cuisines from booths like the Feast of the Three Kings and L’Chaim! Holiday Kitchen. This festival serves a lot of sweet treats as well, such as mulled wine and milk and cookies. The variety of food choices can be overwhelming- and can get expensive. Consult your complimentary passport to check out the menus and prices of each booth ahead of time, and plan what you’d like to try first. I recommend getting a gift card for the food booths, which you can wear around your wrist like a bracelet (this way, you won’t have to worry about pulling cash or credit cards out at every stop). Happy eating!